One of my New York coworkers confused Cincinnati & Cleveland the other day, & I scoffed, "Cincinnati is practically Kentucky." My boss chimed in, with one of those laughs that is not really meant to be funny, "And Cleveland is practically what? Western Pennsylvania?" Low blow, people who think Ohio is the sticks. But I love Cleveland, & Cincinnati is, well, Cincinnati. It's nearly a four-hour drive from home &, like, what's even there? My aunt & uncle & cousins live in the suburbs, & I've always enjoyed visiting them - not least of all because they have a great swimming pool in their backyard - but as a city, Cincinnati has never held much allure for me. When I visited the family over Fourth of July weekend, I changed my mind. As it turns out, Cincinnati is kind of awesome. 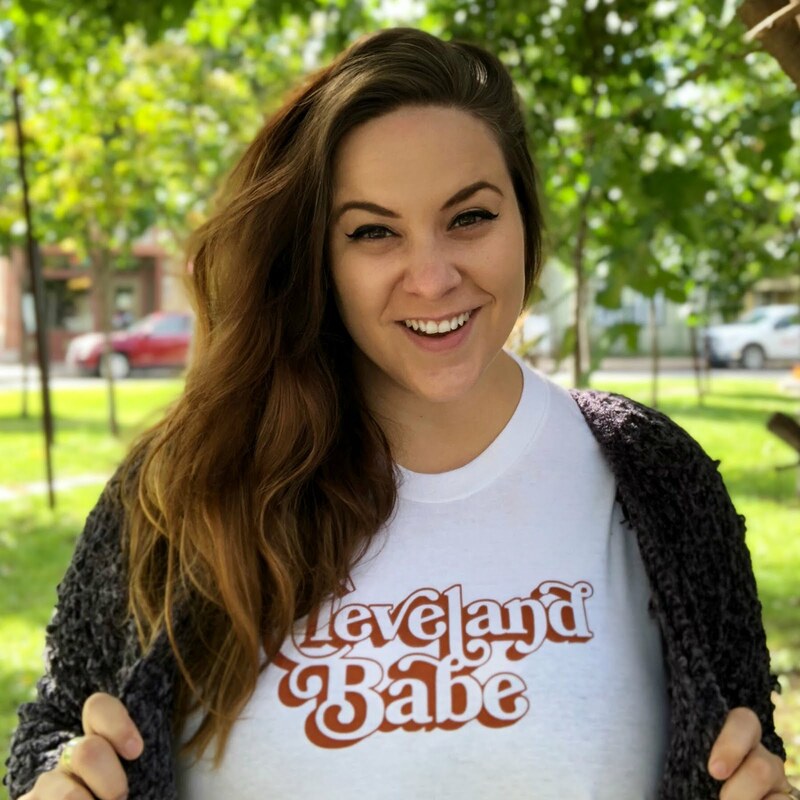 My family & I went downtown the day after the holiday to spend some time exploring the city's many recent developments, & I was so impressed by it that I even had a moment of wondering, "Should I move here instead of Cleveland?" I mean, my mind wasn't that changed. But I had such a good time that I'm already planning my next visit. 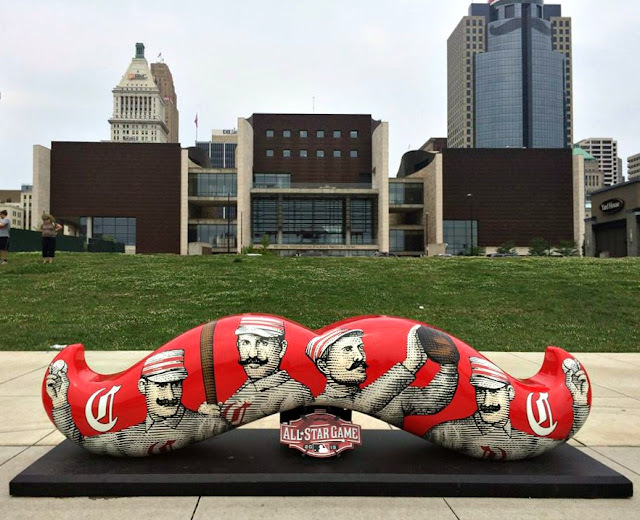 The city had long been readying itself for the 2015 All-Star Game, which meant everything was in tip-top shape & full of quirky details like... mustaches everywhere? I'm not sure why they chose mustaches, but there was one painted onto a tall building, & there were funny little statues of them all over the place (both seen below). 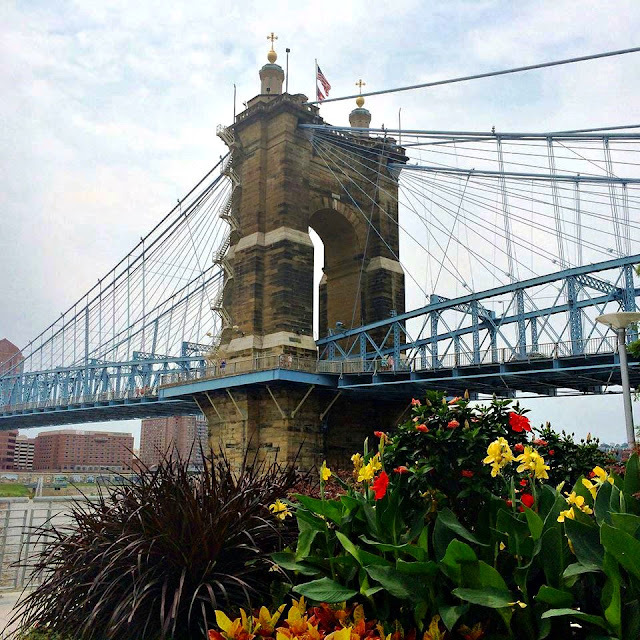 In the center of it is the Roebling Suspension Bridge, which connects Cincinnati to Covington, Kentucky, across the water. When the bridge opened in 1866, it was the longest suspension bridge in the world, at 1,056 feet long. By now, it's fallen to 145th on the list of the world's longest suspension bridges (the Verrazano-Narrows is the longest in the U.S.), but I still think it's beautiful. 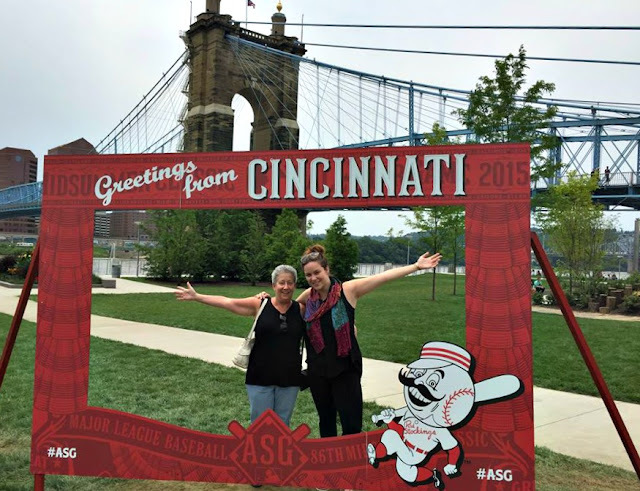 We spent most of our time at the newly renovated Smale Waterfront Park, set along the Ohio River overlooking Kentucky. It's 40 acres large & one of the coolest parks I've ever visited, despite the fact that it's still unfinished in the midst of a $120 million renovation. When we visited, it was still under construction & awaiting elements like an esplanade & a farmers market, which I know because we made small talk with a chatty woman who's studying for the Cincinnati Parks Foundation's docent test. There's so much to see in this park. 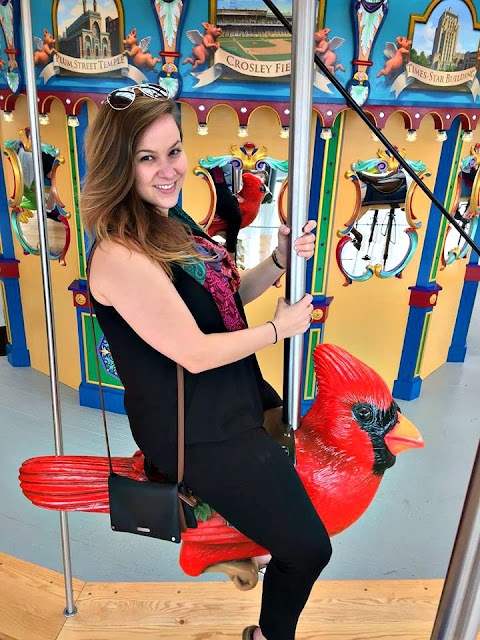 It's full of creative playground elements, like interactive fountains, a rope bridge, some wacky-looking slides, & a big, metal pig with wings on a high-up pole, which kids can climb into for a quick "flight." 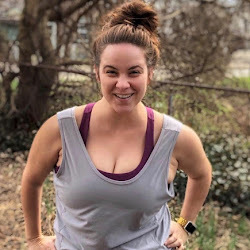 It's designed to create opportunities for "inadvertent exercise" so that kids can get healthy while they have fun - & obviously it's also a site for lots of adorable scenes. One of my favorite parts of the park were these massive, metal porch swings that overlook the river. They would be the perfect place to sit on a sunny day (which was not exactly the case on the overcast afternoon we visited) to eat lunch or go on a little picnic date. My other favorite part of the park was Carol Ann's Carousel, a gorgeous, brand new carousel housed in a large glass "box" that, of course, overlooks the river. It costs $2 to ride, & you get an adorable, old-timey token after you've paid. There are 44 animals to choose from, including standard horses & more uncommon characters like a ladybug, a bat, & a housefly. My mother opted for a large rabbit, & I, perhaps unsurprisingly, chose the cardinal - Ohio's state bird, duh. I also got really excited about the term #carouselfie, though I suppose that because someone else took this photo, that term doesn't actually apply here. Just go with it. We weren't in downtown Cincinnati for long, & despite a very full afternoon, we actually didn't get very much sightseeing in, so I'm already thinking of making another visit that way in the near future. I'd like to check out the American Sign Museum & the Underground Railroad Museum & also maybe some things that aren't museums, like... I have no idea what, because I don't know what else is actually in Cincinnati - but I love the idea of continuing to explore Ohio & falling further in love with all the mini adventures this state has in store for me.